Western Utopia Planitia in the Northern mid-latitudes of Mars is marked by a peculiar type of depression with scalloped edges and by a network of polygonal fractures. The scalloped depressions are typical features; a smooth layered terrain located between 40 and 60 degrees in both hemispheres. Scalloped depressions probably form by removal of ice-rich subsurface material by sublimation (ice transforming directly from a solid to a gaseous state), a process that may still be active today. Isolated scalloped depressions generally have a steep pole-facing scarp and a gentler equator-facing slope. This asymmetry is interpreted as being the result of difference in solar heating. Scalloped depressions may coalesce, leading to the formation of large areas of pitted terrain. The polygonal pattern of fractures resembles permafrost polygons that form in terrestrial polar and high alpine regions by seasonal-to-annual contraction of the permafrost (permanently frozen ground). On Earth, such polygons indicate the presence of ground ice. These landforms most likely show that sub-surface ice is present or has been present geologically recently at these latitudes, and they may slowly be continuing their development at the present time. This is a stereo pair with PSP_002439_2265. The ejecta spraying out of the new crater landed back on the ground and then continued to flow away from the new crater, and the smaller crater was in the way of that muddy flow. You can see where much of the muddy material flowed around the crater’s uplifted rim and forms a squiggly ridge, but you can also see where the mud flow slid over the rim and ponded down in the bottom of the crater. One question we don’t know the answer to is: “how wet was the muddy ejecta?” Ongoing observations like this and laboratory-based experiments are trying to find the answer to that question. Southern spring on Mars brings sublimation of the seasonal dry ice polar cap. Gas trapped under the seasonal ice sheet carves channels on its way to escaping to the atmosphere. At this site, the channels are wider than we see elsewhere on Mars, perhaps meaning that the spider-like (or more scientifically, “araneiform”) terrain here is older, or that the surface is more easily eroded. 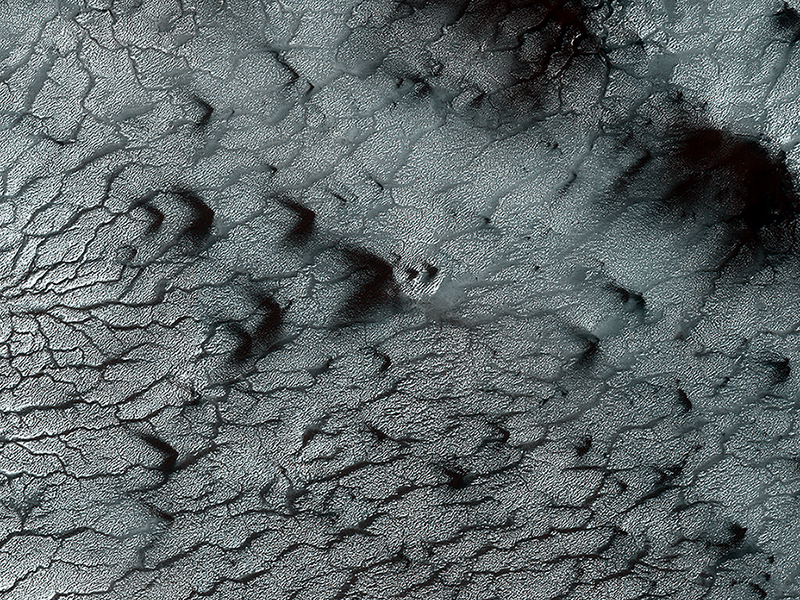 Seasonal fans of eroded surface material, pointed in two different directions, are deposited on the remaining ice. 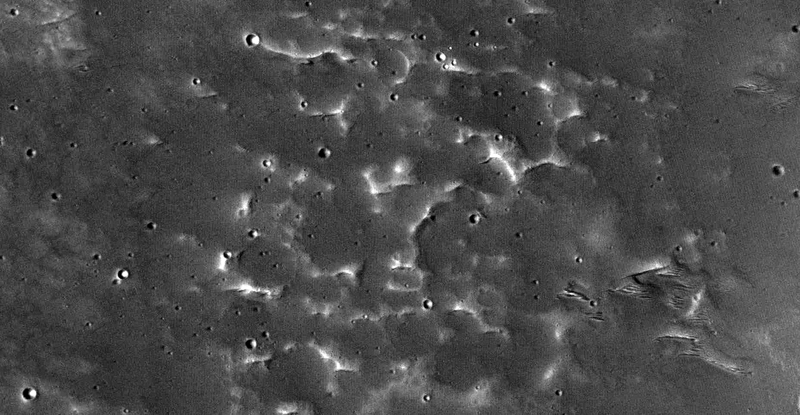 This image of a well-preserved unnamed elliptical crater in Terra Sabaea, is illustrative of the complexity of ejecta deposits forming as a by-product of the impact process that shapes much of the surface of Mars. 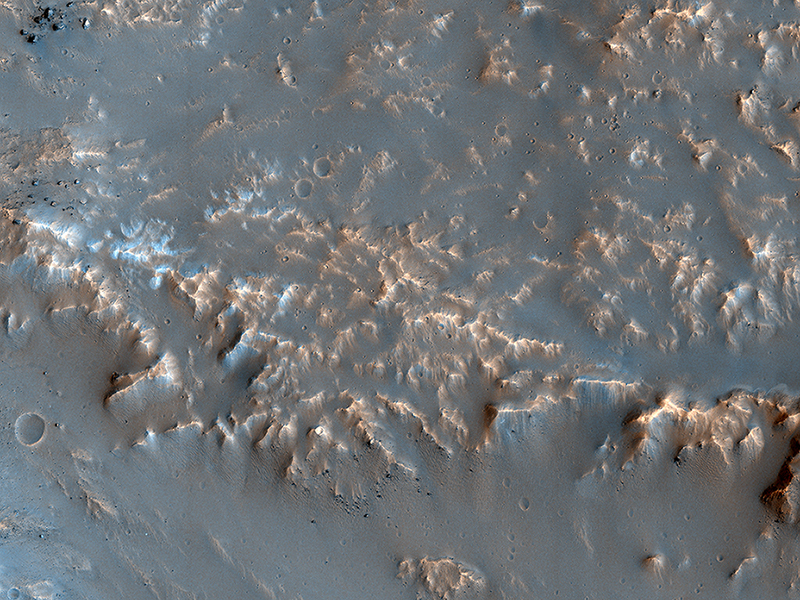 Here we see a portion of the western ejecta deposits emanating from a 10-kilometer impact crater that occurs within the wall of a larger, 60-kilometer-wide crater. 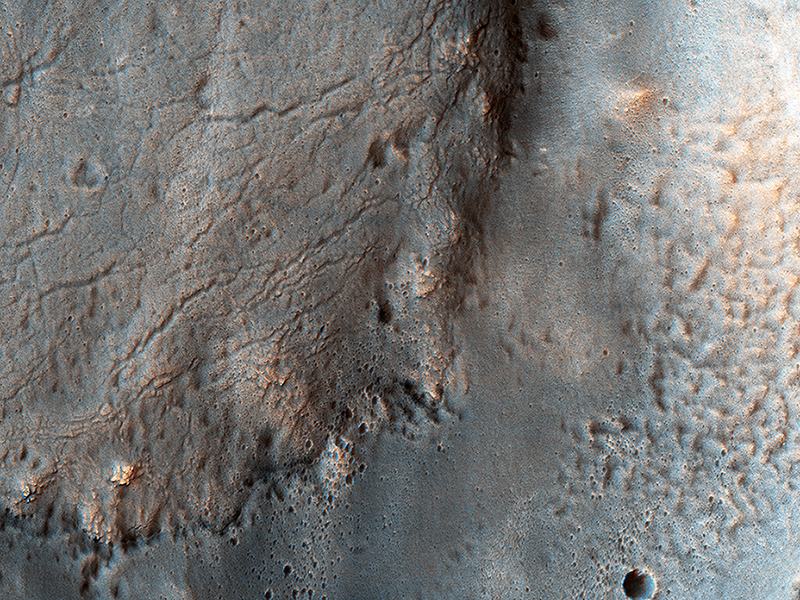 In the central part is a lobe-shaped portion of the ejecta blanket from the smaller crater. The crater is elliptical not because of an angled (oblique) impact, but because it occurred on the steep slopes of the wall of a larger crater. This caused it to be truncated along the slope and elongated perpendicular to the slope. As a result, any impact melt from the smaller crater would have preferentially deposited down slope and towards the floor of the larger crater (towards the west). 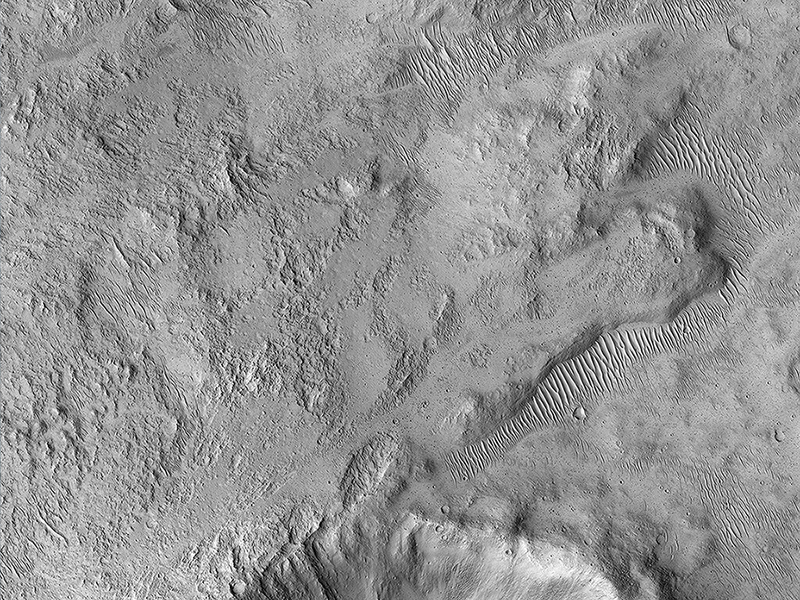 Within this deposit, we can see fine-scale morphological features in the form of a dense network of small ridges and pits. These crater-related pitted materials are consistent with volatile-rich impact melt-bearing deposits seen in some of the best-preserved craters on Mars (e.g., Zumba, Zunil, etc.). These deposits formed immediately after the impact event, and their discernible presence relate to the preservation state of the crater. This image is an attempt to visualize the complex formation and emplacement history of these enigmatic deposits formed by this elliptical crater and to understand its degradation history. The ancient highland channels in this image empty into the Eridania Basin (not visible), a large topographically low enclosure with smooth-appearing terrains that may have once contained a large paleolake or ancient sea. Water in these channels flowed to the east into Ariadnes Basin, a smaller basin located within the confines of Eridiana. 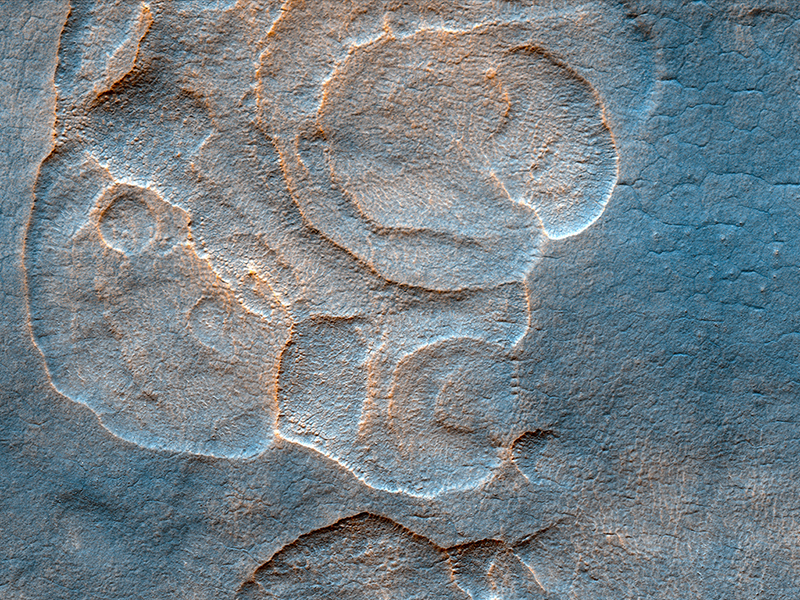 Light-toned knobs are exposed in the northern channel, while the other channels are partially filled with smooth appearing lobe-shaped surface flows that are extensively fractured when viewed at high-resolution. Although the origin of these knobs is not known, interpretations include fumarolic mounds, erosional remnants, pingos, mud volcanoes and spring mounds. The movement of the once ice-rich, channel-filling flows over the knobby terrains likely created radial tension stresses producing the cracks that we see on the surface of these deposits. As the material slowly thinned, it eventually led to the formation of an elephant skin-like texture. This texture is different from the surrounding eroding mantling deposit that has become pitted as the ice sublimated causing the overlying surface to collapse. 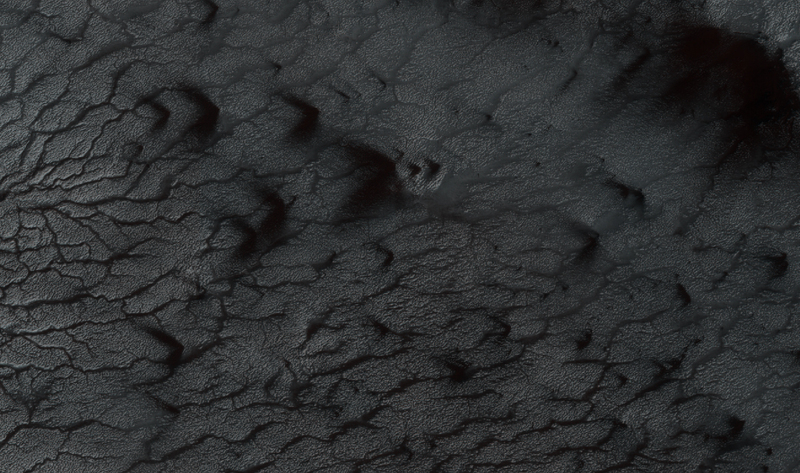 The combination of such knobby terrain and smooth, channel-filling deposits are seen only in a few places on Mars. One such example is the Navua Valles channels northeast of the Hellas Basin that may have also hosted a large, ice-covered lake in the past. Their morphological similarities, particularly in their surface materials, suggest that they formed under similar paleoclimatic conditions. For more information on the Ariadnes basin, see this link to a geologic map of this region (PDF).